It seems only in Michigan will one use the air conditioning and heat in the same day. 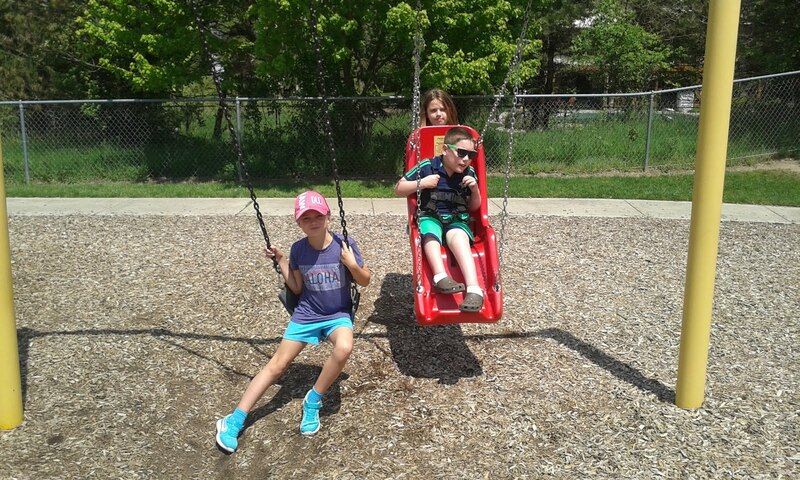 The week began unseasonably warm, with Cam enjoying the swing at school with friends Violet and Rosa. Back at home, we decided it was time to break out the hammock- this was all Cam's idea, and he was the first to get in and relax. The hammock was a gift from Auntie Roe that she brought back from Brazil a few years ago. Right before the weekend arrived, the weather turned cool and suddenly, we were all back in pants. Eager anticipation was high in our household looking forward to all of the upcoming events. First, Ms. Amanda's brother, Johnny, invited us to his high school open house on Friday evening. We dined on freshly grilled hamburgers and hot dogs, homemade potato salad, baked beans and all of the fixings. Of course, some delicious graduation cake completed the meal. We feel like Amanda's family is our second family and we had fun seeing everyone and hanging out. Saturday morning, we made the trek to ballpark and even arrived a little early for Cam's game. It was cooler, but the sun peeked out behind the clouds and the rain held off for the West Michigan Miracle League. Seth and Julie were our helpers from Grand Valley State University. Cam used the batter box again and Oma and Opa were in attendance with us. We are grateful to them for making the drive from up north! Cam was super excited for Brody's birthday celebration, scheduled for right after the game. 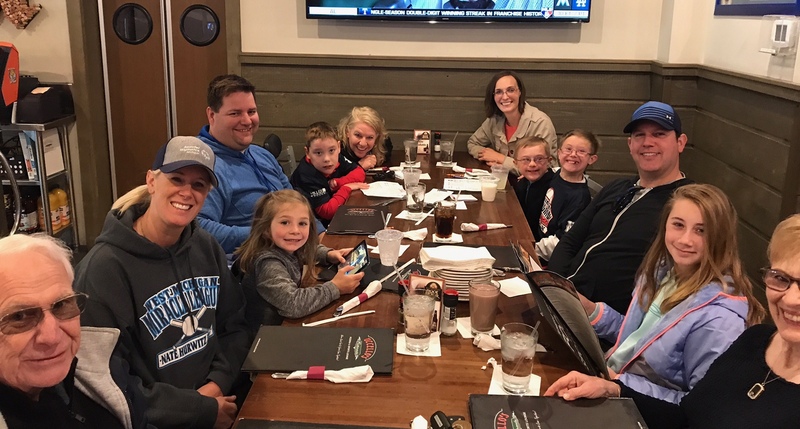 We were all to meet at Ucello's in Rockford, one of Brody's favorite eateries. Two friends were invited by the birthday boy- Cam and Breckin. The group shared appetizers of pizza puffs (Cam highly recommends this new treat) and lunch. A dessert of a football birthday cake and strawberry shortcake hit the spot. Brody's family generously treated the entire gang. Cam helped pick out Brody's present of games and a picture of the two of them taken at school by Ms. Kathy. 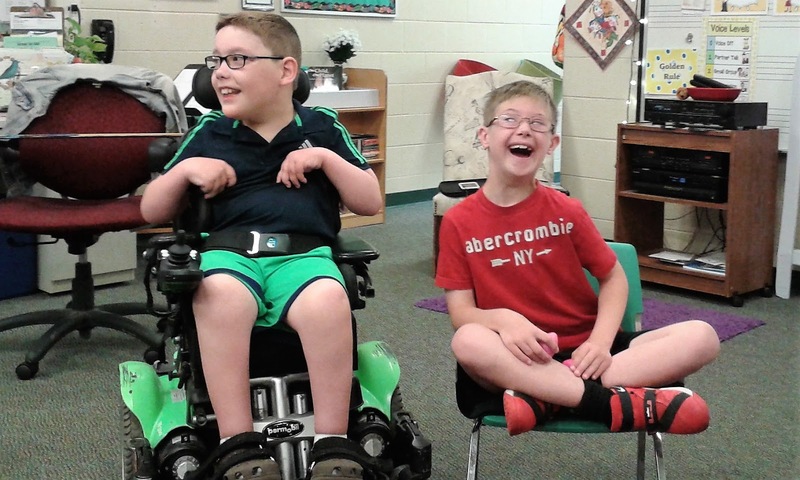 The picture, shown here, was put in a frame labeled "Friends" and we think this duo will be lifelong buddies. Sunday brought our annual dinner with the Raisch fam and Emma popped over a couple of hours before our evening feast. It always feels like summer is near when the sidewalk chalk makes its way to our driveway with Emma's artistry. A new addition to "Chalk City" was a bad guy jail where Cam was asked to go if he wasn't listening or did something that warranted a trip. The only problem was...he kept breaking out of jail! When Emma wasn't looking, he would make a quick getaway and she would have to go after him. This game went on for quite some time...the next best thing to Chalk City is hearing squeals of delight, loud laughter, and forever friends talking in our driveway. We often wonder where Cam picks up new phrases. He either doesn't recall or possibly doesn't want to share, but these were a few choice ones from the week. "I'm so tired I'm going to pass out!"